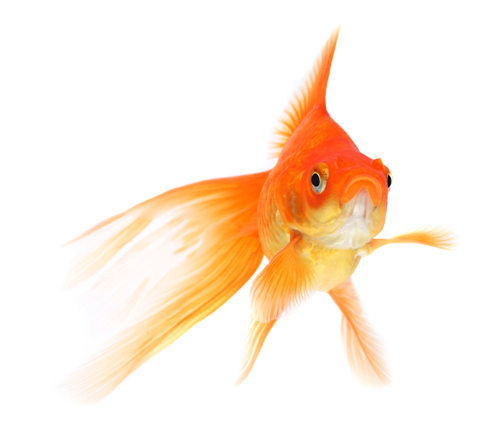 CanadaVet.com Blog: Do Goldfish Really Have A Three Second Memory? In fact, goldfish have very good memories and can be trained to respond to various sensory cues such as color, light and music. Goldfish have also proven to remember things they are taught as much as a year later. Researchers have taught goldfish to play fetch, push levers, do the limbo, and even play soccer. Have you ever noticed a goldfish getting really excited when it’s feeding time? If they are fed around the same time each day, they seem to anticipate the time leading up to feeding, which shows that they have a good sense of time. Goldfish also have shown to recognize their master (usually the one who feeds them) and be a lot more active around them. They even sometimes stop considering that person as any sort of threat, including if that person sticks their hand in the tank, however around strangers you may notice goldfish tend to hide away.